Scunthorpe is pretty famous, but why? Is it famous for having significant natural ironstone deposits which have been mined since the 10th century? No. Maybe it’s for Forest Pines – the internationally acclaimed championship golf course? Nope. What about for having the largest steel processing plant in the whole of the United Kingdom? Still no! Firstly, within the cyber world for an anomaly that IT boffins call ‘The Scunthorpe Problem’. Contrary to popular belief the Scunthorpe problem is not that people from Scunthorpe live there but rather the random grouping of letters in the middle of the town’s name spelling out a somewhat rude four-letter profanity – which in turn means it’s often automatically blocked by internet obscenity filters. Let me tell you that I have been asked this question a lot – in fact an awful lot. Usually by helpful people who genuinely think I may have never been asked it before! In fact it was even the first question an audience member asked me when I walked off stage at the Perth Comedy Festival, Western Australia, and so I think we can now say that it’s officially an International Mystery. Although not quite in the Seven Wonders of the World category, I still think it’s actually a legitimate question. In the Domesday Book (1086) the town was called Escumesthorpe. 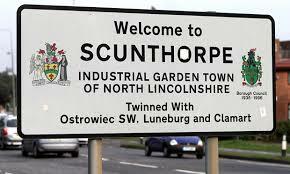 Somebody, at some time, actively made the decision to change the name and actually put the c*** in Scunthorpe. It’s there in black and white! Earlier I described ‘The Scunthorpe Problem’ as arising from a random grouping of letters but perhaps that was an over-generous assumption on my part. It is possible that many years ago there was a town meeting, held in the tap room of Ye Olde Dog and Ducke, where an inebriated town elder suggested that the name be changed to encapsulate the most obscene, misogynistic and offensive word ever thought of by humankind (although it was probably a bloke). Maybe it was just a conscious rebrand to generate interest – after all Cockermouth has had enough attention! The possibility that it was an accident is in many ways even more disturbing because you’d really have to be as thick as two medieval short planks not to spot it was there and fail to foresee the very obvious ramifications to follow. I mean the Beckhams might get away with dishing out daft names but they don’t have to pack their kids off to a Scunthorpe Secondary School. If they had I’d suggest that Romeo would be carrying a few duelling scars by now. I can just picture the teacher doing the morning register “O Romeo, Romeo, wherefore art though Romeo?” “He’s scrapping behind the bike sheds again Miss”. The other reason why Scunthorpe is famous is because the rapper Tinie Tempah mentioned the place in a song. The number one hit, and 2011 Brit Awards best single, ‘Pass-out’ contained the line: “I’ve been to Southampton but I’ve never been to Scunthorpe”. That’s ‘cos we wouldn’t let you in Tinie, for Health and Safety reasons. We’ve got height restrictions, like Alton Towers, to stop little people getting bullied. You see you’re of the hip hop, drum and bass genre whereas we’re more of the ‘what you effing looking at?….Ger int’ car Dave he’s not worth it’…genre. The song in question was quite a protracted 4 minutes 28 seconds in length but would have been much longer if Tinie had chosen to systematically list all the other places to which he’d also not been. I don’t know about you but I often find myself wondering if this Plumstead lad has ever popped oop t’ North to have a sneaky peak at Chesterfield or Rotherham? I notice on the first single from Tinie’s 2015 ‘Junk Food’ album (sorry mixtape not album – silly me) called ‘We Don’t Play no Games’ that he didn’t feel it necessary to list all the games he hadn’t played: “I’ve played Twister but I’ve never played Tiddly…winks!” (That line’s funnier if you rap it in a Tinie Tempah voice). For those that like an edgier gangsta-style rap you may prefer Tinie’s 2013 single ‘Looking down the barrel of a gun’. In the song he explains that he’s looking down the barrel of a 12” Magnum – but I’m sure you share my disappointment that he declines to inform us of all the barrels he’s not looked down…..So he’s sorta just left us hangin’ there bro. The funny bit for me about writing this is that I felt the need to do a little research in order to have a Tinie tease and so I listened to a clip of his album and thought….. “that’s alright actually” – and now I often have his music on in the car. Consequently I’ve become one of those annoying nodding Winston-dog types causing a drum ‘n’ base noise nuisance in my Peugeot 207 whilst stationary at the traffic lights. My wife says that for my birthday she’s getting me one of those over-large glittery decorated baseball caps so I can wear it back-to-front when I’m cruising on down to the Council tip with the gardening waste. So I think what I’m really saying is: “Leave Scunny alone Tinie”….or rather Patrick – the name he was known by at Plumstead Primary. I’m sure Plumstead was a perfectly nice place to grow up – although I can’t actually be sure because I’ve never been to Plumstead… but I’ve been to Southampton.